Arab League letter 'endorses' direct talks, while leaving preconditions that prevent them. 'No Jews allowed' in Abbas' planned state. On Thursday, the Arab League published a letter backing direct talks with Israel, the first such negotiations since 2008, leaving the timing of the proposed talks for PM Chairman Mahmoud Abbas to decide. Maainstream media such as the Wall Street Journal, hailed this move, quoting U.S. officials who saw it as a step up of "critical momentum" towards negotiations, in response to United States Prsident Obama's pressure on the PA leader. Obama had begun demanding that Abbas engage in direct talks following Israeli Prime Minister Netanyahu's recent visit to Washington where the Israeli PM repeatedly declared willingness for direct talks without any preconditions from Israel, thereby placing the ball in the PA court. The Arab League's missive, however, according to those who saw it, repeats the preconditions set by Abbas that remain the stumbling block to negotiations, as they predecide some of the PA desired outcomes of these very same negotiations: a return to 1967 borders, an end to settlements, the return of refugees, this by asking the US government to secure assurances that the demands are met before talks can begin. Abbas was quoted by the official Egyptian Maan News Agency as reiterating "When I receive the demanded guarantees, which are the acceptance ofthe1967 borders and an end to settlements...I will immediately enter negotiations", just before the Arab League vote on Thursday. Abbas has repeatedly demanded that Israeli completely freeze construction for Jews in areas east of the 1949 armistice line, including north, south, and east Jerusalem, and that Prime Minister Binyamin Netanyahu commit to creating a PA state with borders based on the armistice line. Until those conditions are met, Abbas has said, the PA will not negotiate. "I will never allow a single Israeli to live among us on Palestinian land,” Abbas declared. Israel is home to a sizable proportion of Arab citizens, who have the vote and are represented by Arab parties in the Knesset. De facto, both Abbas and the League nixed the talks, but INN analysts viewed the publication of the letter and discusiion of conditions as an attempt to throw the ball back into Israel's court, while trying to gain empathy for Abbas. In this vein, the WSJ reported that members of the PA delegation to the League meeting considered denouncing Abbas for accepting the contents of the League's letter but changed their minds. The newspaper quoted Arab leaders as saying tht the Arab League endorsed the talks but left the timing and location up to Abbas, which results in isolating him and pressuring him to start before he is ready.. "All the pressure is now on his shoulders," a person close to him was said to have remarked sympathetically. Arab League members also claimed they had received new support from United States President Barack Obama. 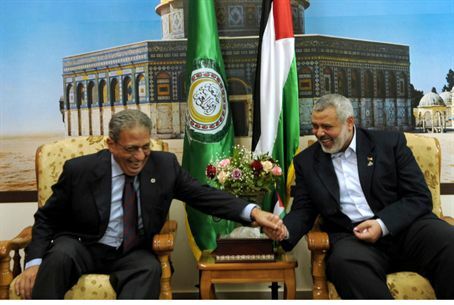 A recent letter from Obama to Abbas included “guarantees,” according to League head Amr Moussa. He did not specify if the alleged promises were the ones requested in the League's Thursday letter. During the Arab League meeting, Abbas expouunded on why negotiations with the previous Israeli administration, headed by then-Prime Minister Ehud Olmert, failed to yield a peace deal. “We almost reached an agreement, and I agreed to a land swap for 0.19% of the territory, while he suggested 6.5%. I refused, and we did not reach an agreement,” he said. The land swap idea is meant to allow Israeli population centers in Judea and Samaria to remain in their current locations even in the case of an Israel-PA peace deal. Abbas also reiterated his support for the “right of return,” the demand by Arabs who fled Israel during the War of Independence when their leaders promised them a quick return after the Jews' annihilation, to come back to the country along with the hundreds of thousands of children, grandchildren, and great-grandchildren born since. That demand is the reason they remained in squalid refugee camps as opposed to the larger number of Jewish refugees expelled from Arab lands in 1948 who became productive citizens of the land of Israel.